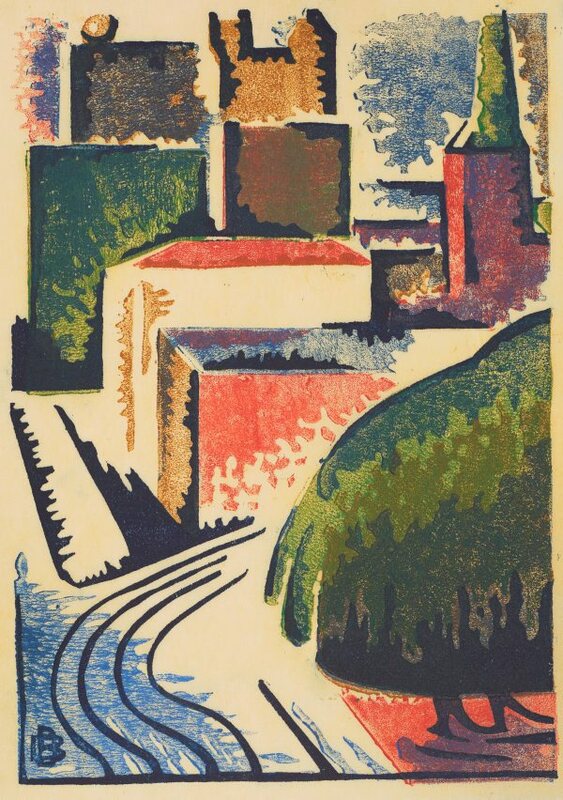 Dorrit Black was a key figure in the development of modernist aesthetics in Australia during the interwar decades, largely due to her work as a printmaker. Born in Adelaide, Black arrived in Sydney in 1915 and studied under Julian Ashton and Elioth Gruner. During the 1920s she was increasingly focused on 'modernising' her practice and in 1927 travelled to Europe in order to acquire (in her own words) "a definite understanding of the aims and methods of the modern movement and in particular - the cubists". She initially studied linocut printmaking with Claude Flight at the Grosvenor School in London, an important centre for the development of modernist prints in England, but also for Australia – several of Flight’s best students were Australian. This print is strongly redolent of the aesthetic she developed at the Grosvenor School, which encouraged ‘modern prints for the modern age’ with subjects including the modern city, dynamic movement of the figure and nature, all through the new medium of the colour linocut. Black later moved to Paris where she enrolled in the Academy of the Salon cubist André Lhote. Black also worked briefly with Albert Gleizes in 1929 prior to her return to Australia. Black held her first solo show in Sydney at the Macquarie Galleries in 1930, exhibiting works that declared the cubist-inspired aesthetics that she had developed during her studentship overseas. Signed in image to print l.l. in black ink, " DB [monogram]". Not dated. Dorrit Black: unseen forces , Adelaide, 2014, 205 (colour illus.). The art of Dorrit Black , North Melbourne, 1979, 132. Cat. no. L28 (dated 1930-35).